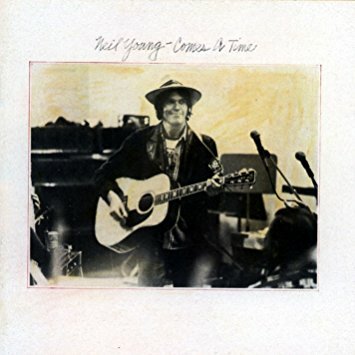 After the hodgepodge that was American Stars and Bars, Neil turned in one of his most consistent — and long underrated by me — albums, the country-folk Comes a Time. While not quite as epochal as Harvest, Comes a Time was buttressed by Nicolette Larson’s top ten hit single yacht rock cover of “Lotta Love,” the residual effects of which helped make it his best-selling album in over half a decade. Back from the ditch! He’s even got a goofy smile on the album cover, the only time in his entire discography that ever happened. Larson was also all over Comes a Time proper, no more so than the title track, which was essentially a duet between the two of them, with most of the musical heavy lifting done by an army of acoustic guitars, Rufus Thibodeaux’s fiddle and a full-blown string section. In the middle of the song, where you might expect a guitar solo, or a harmonica solo, instead the string section just plays the melody of the verse with the fiddle as a counterpoint, and while it skirts on being cheesy, it’s also incredibly lovely, and leads into the coda: Neil and Nicolette harmonizing on the title over and over until the fade.